Perfect for style-conscious men and women, Robemart’s selection of luxury bathrobes are available in a wide range of colors, styles, sizes, and lengths. Made with premium fabric like 100% Turkish cotton, silky soft satin, and ultra plush microfleece, our collection of luxury robes are the best choice for any time you want to feel relaxed and pampered. Whether it’s for a five-star hotel, beauty clinic, or spa, wrap yourself in softness with luxury bathrobes from Robemart, the #1 source for high-quality robes at the lowest prices. Ultra soft and luxurious, luxury robes also make a thoughtful and inexpensive gift that will be cherished for years. Robemart’s luxury Turkish cotton robes are baby soft to the touch yet lightweight and absorbent, making them ideal for any climate. In this classic style luxury robe, every detail has been considered for your comfort, such as a fluffy terry cloth shawl collar that provides extra warmth and coziness. A popular choice for amenities at a luxury hotel, the terry cloth robe collection also features other style options such as an extra large hood for keeping your head warm and 100% Turkish cotton velour, a type of brushed terry that adds a glossy sheen to the exterior. At Robemart, luxury meets durability with the waffle velour shawl robe, the ultimate combination of comfort and functionality. Woven with a waffle pattern of 100% Turkish cotton, the waffle velour style robe is lightweight and absorbent while also keeping you warm with a fluffy and soft feeling to the touch. 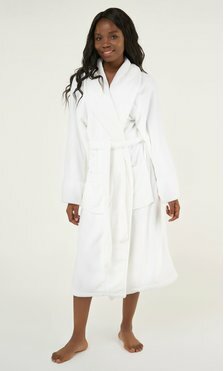 Another go-to option for upscale hotels and med spas, the clean lines and relaxed fit of these luxury bathrobes make them the best choice for men and women of all shapes and sizes. 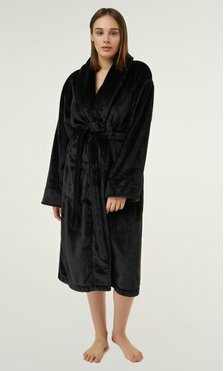 Another style option for unisex luxury robes, Robemart’s line up of plush robes are perfect for feeling pampered when getting in and out of the bath, sauna, or pool. Made with ultra-soft fabrics like microfleece and Turkish cotton, our selection of premium quality robes are designed to keep you feeling warm and cozy. Other choices for feeling relaxed and pampered are a selection of super soft Tahoe microfleece luxury robes. The shawl collar adds another layer of fluffiness and the full-length silhouette provides plenty of coverage. Along with heavenly soft terry cotton and microfleece in unisex styles, Robemart also features a selection of stylish and elegant satin luxury robes for women. Designed with silky soft satin and a mid-thigh length, this elegant robe can be used as a lightweight coverup for pajamas, undergarments, and swimsuits. A bestselling item for wedding parties, our satin robes are available in a range of trending colors, which can be easily coordinated with a special design theme. For a personalized touch, Robemart also offers embroidery, which gives you the option to add monogramming for a thoughtful bridal party gift or a special logo that reflects your brand. Available in embroidery, vinyl printing, or rhinestones, customized orders will be shipped in 3 days for your convenience. As part of our 100% satisfaction guarantee, we also offer hassle-free returns and exchanges. You can save even more money with our daily shopping incentives, which include free shipping on orders of $150 or more and quantity discounts--the more you buy, the more you save. Shop our collection of luxury robes today and discover a world of comfort and style at affordable prices.